Car Seat Ages: What Car Seat at What Age? For a busy parent (or in other words- any parent!) there is so much that you have to consider when it comes to keeping your child safe. One major thing of course is the car seat that you select. Picking the right seat and installing it properly is incredibly important. However, unfortunately, your job is not complete once you select one seat and get it installed. As children grow, they require a different type of seat. While there are plenty of seats on the market today that are convertible and can be used for several years, the seat still has to be adjusted as your child grows. Are you aware of the proper car seat ages? If you aren’t: don’t panic! We have put together this helpful guide that will walk you through each type of seat, along with general guidelines of when your child will be at each point. 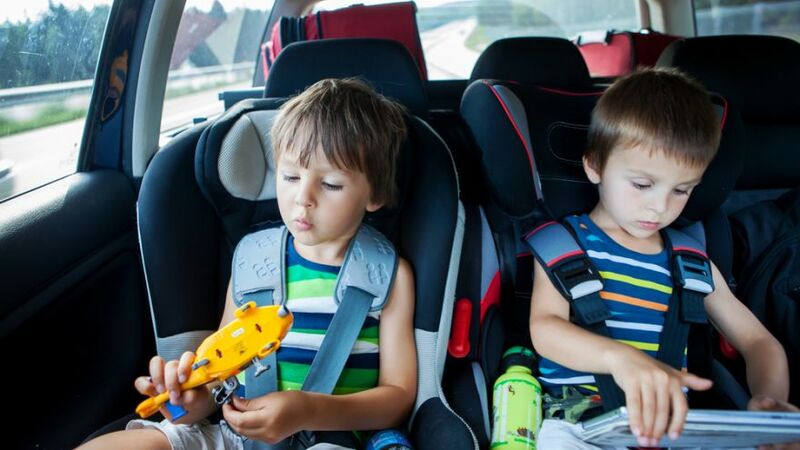 Whether you get separate seats or use a convertible model is up to you, but you need to be aware of various stages and when your child should be in each one. Note: As always, only use this guide as a general guideline. Always consult your individual car seat manual to see specifics in terms of weight and height requirements. Do not keep your child in a seat if they exceed the maximums, no matter what this guide (or any other) one says! When your child is first born, the safest position for them is in a rear facing car seat. This rear facing position is much safer for small children, and is especially important in case you should get in a car accident. In this position, your child will experience far less movement or whiplash compared to if they were in a forward facing seat. At this age a child’s bones are still forming and are malleable and are therefore very susceptible to damage and cannot handle a lot of force. For this reason, you should absolutely start your child off in a rear facing seat. Children should stay in a rear facing seat as long as possible, as this is the safest position for them. The recommendation at this point is that children should remain rear facing until they are three years old. 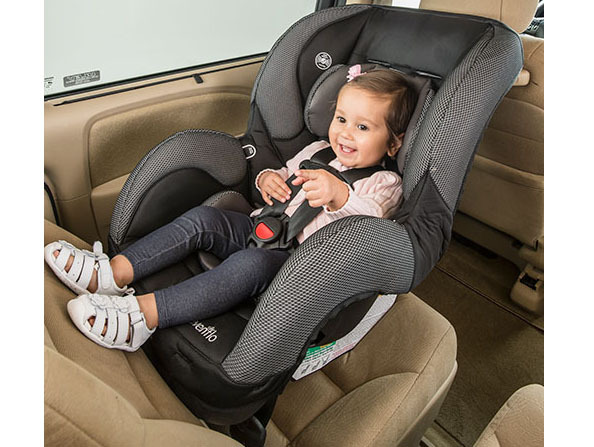 However, check your specific model and consider selecting a seat that has a high weight limit, and keep your child in this position until they outgrow the weight limit. 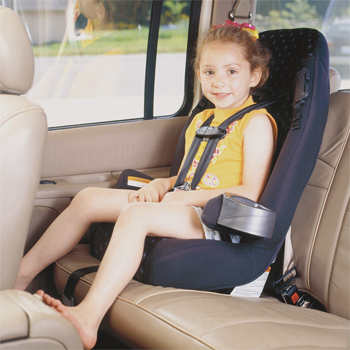 Even if your child reaches three years old, keep them rear facing if they have not reached the weight limit. Once your child is big enough, hopefully at least three years of age, you may switch them from a rear facing seat to a forward facing seat. This seat will largely be the same as a rear facing model, the large difference is the position of the seat. A forward facing seat still contains a strong harness and, hopefully, lots of safety features and padding. Your child is still very small at this age and needs a seat that has a secure harness that will help keep your child in place in case you get in an accident. You still want to reduce the amount of movement that will occur in case you get in an accident, and with a good forward facing seat, your child will be very safe and secure. As far as age is concerned, a child will typically use a forward facing car seat until they are seven years old. In terms of weight, you want to keep your child in a forward facing seat until they are about 80 pounds. This may seem like a lot, but in reality your child is still small at this age and still requires the use of a harness. The next step involves a seat without a harness, so you do not want to rush this jump out of a forward facing seat. Always follow weight maximums for your seat, but preferably you should choose a model with a limit that is between 80-85 pounds. The next step you will take with your child is a big one. Once they are around eight years old and weigh 80 pounds they can switch from using a car seat to using a booster seat. Booster seats vary greatly from car seats. Car seats use their own harness systems to keep your child in place, while a booster seat uses your regular seat belt to secure your child. There are two types of booster seats, and the first type is a high back booster. This seat, as the name suggests, is a large seat that contains its own back and still provides a fair amount of support and safety for your child. There is less of a distinction of when a child should switch between a high back and a backless booster. In fact, some children remain in a high back booster until they are ready to get rid of the booster seat altogether. Typically, a child will remain in a booster seat until they are around 12 years old, weigh around 100 pounds and are at least 4 foot 9 inches. If you wish to switch your child to a backless booster seat, this should still be done once the child is old enough to be out of a forward facing car seat. 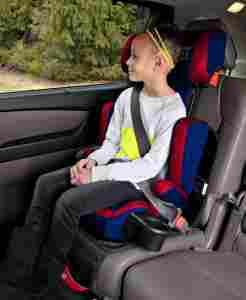 A backless booster provides no side impact protection, headrest, or other additional features other than the bottom booster portion that elevates your child so that your seat belt fits them comfortably. A seat belt fits a child properly if it fits low across their lap and goes across their shoulder. If the seat belt is up high around a child’s neck, they are clearly too small and an adjustment needs to be made. Again, children will be in a booster seat until they are around 12 years old and up to 100 pounds. Once your child is 100 pounds and 4 foot 9, they are ready to abandon their car seats altogether and start using just a regular seat belt. Again, when making this switch you need to make sure that when your child is sitting and strapped in that the seat belt is hitting them properly. A seat belt in the wrong position can turn into a weapon in the event of an accident instead of being a source of protection. A child riding with just a seat belt should be able to sit comfortably in the car with their legs hanging down (not sticking straight out). The seat belt should fit securely and sit low across the child’s lap, and go up across their shoulders. One final thing to keep in mind is that when a child first starts using a seat belt they are not allowed to ride in the front seat. Children should remain in the back seat until they are at least 12 or 13 years old. They are much safer in the back seat, so unless they absolutely need to sit up front, consider keeping them in the back seat beyond the age of 12 or 13. Finally, once a child is big enough, they can feel safe to ride in the front seat. As an absolute minimum they should be above 4 foot 9, 100 pounds, and 13 years of age. However, it is safest for them to wait until they are even older and bigger. 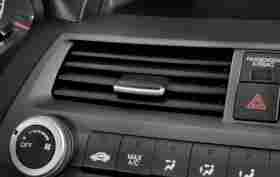 If they should be sitting up front during a car accident when the airbag goes off they might sustain serious injuries due to the force of the bag. For this reason, children are safest in the back seat until they are large and strong enough to handle the force of an airbag.